Bermuda used to have a public railway that served the island's eastern and western cities between 1931 and 1948. 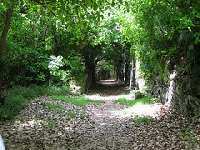 In 1984, the government opened the Bermuda Railway Trail as a walking trail and bridle path. A great way to spend a few hours with the kids, the trail can also be cycled, ridden on horseback, or even roller-bladed in certain areas. This 21-mile (35km) trail is a great way to see the island's natural flora and fauna and to experience some breathtaking views and do a spot of bird watching. Organised walking tours are also available.